The folks behind Space Invaders have whipped up three slick new iPhone cases featuring the titular bad guys. 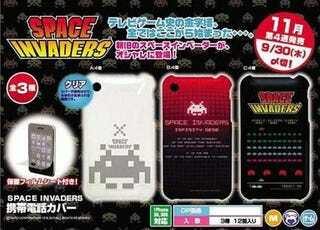 The Space Invaders iPhone cases will fit the 3G and 3Gs models and run your $25.90 each over at importer National Console Support. The aforementioned importer promises that once you've purchased one of the three cases and wrapped your iPhone in it that there is a high likelihood that upon taking the phone out of your pocket or handbag at least one passerby will exclaim "That iPhone is bawlin" and then attempt to mug you. I'm not quite sure if that's the right marketing approach for NCS to be taking, but perhaps the warning comes from the heart.